The best swim caps at the best price. Simple as that! Don't let your swim team overpay for swim caps. Our cap prices are all inclusive with free shipping. 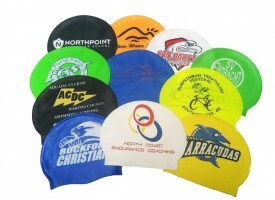 Need a custom swim cap with a color logo printed on both sides? Look no further. Need your latex swim caps numbered for your next triathlon? You've come to the right place. How about some personalized swim caps with individual names? We do those too! 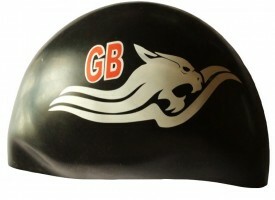 Currently we offer latex, super soft silicone, classic silicone, wrinkle free silicone, dome skull, dome pro and fastskin dome caps in a wide assortment of colors. Be sure to check out our Cap Colors! The dome caps arrived yesterday. They look great! Thanks. I just picked up the caps and they look great. Thanks for helping. They will be a big hit. I received the caps yesterday, they came out really nice. Just wanted to say thanks! Just wanted to let you know that I got the caps and they look great! Am so happy:) Thanks so much for all your help!!! You ROCK! Thanks you so much for delivering the caps on such short notice. They look great! Received the caps this morning. They look great! Thanks for all your help. Caps look great! Thanks for getting them to us so quick!! We really appreciate that! AWESOME!!! I got them last night and they look great - thanks so much! Our swim caps arrived today–wow!!! I was shocked that they arrived soo quickly–Very impressed!!! Well done. 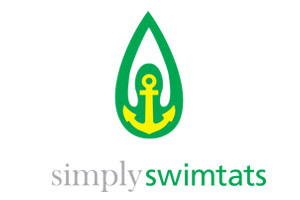 The swim cap is of a very high quality & the logo looks fantastic–I couldn't be happier!! Got the caps! They look great! I received the swim caps yesterday and they look amazing. Thanks so much. 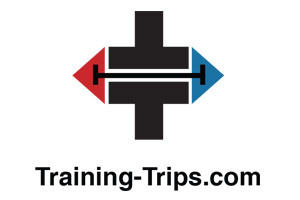 Thank you so much for making this so easy! Great company. I wanted to let you know our caps arrived today in perfect condition. Everyone on our team loves the new caps, they turned out fantastic!! Caps arrived a week prior to the camp start and looked great! Thank you for your great service. These are the best swim cap prices I've seen. I love that there are no extra fees! Printing came out amazing on these swim caps. It's hard to get them off our kid's heads! Simply the best swim caps I've ever purchased and I've been in the industry for over 40 years.